One of the coolest monkeys returns to the console world... not Donkey or Diddy Kong but rather AiAi and his outrageous friends which brings gamers back to the wonderful world of Super Monkey Ball. Thankfully for fans of this series and new comers, SEGA have resurrected their popular GameCube title and released it on the Nintendo 3DS that means Super Monkey Ball has received a 3D makeover. 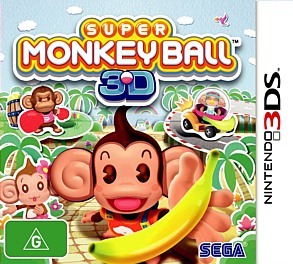 Best of all, this game collects a variety of Super Monkey Ball games in one accessible title but where the game is best is at its original core as you attempt to navigate a monkey within a ball through this 3D puzzler. Apart from the whacky Japanese gaming goodness contained in Super Monkey Ball 3D, the presentation of the game is first class that is reminiscent of those crazy Japanese TV series from its colourful graphics to boppy J-pop soundtrack and strange sound effects. 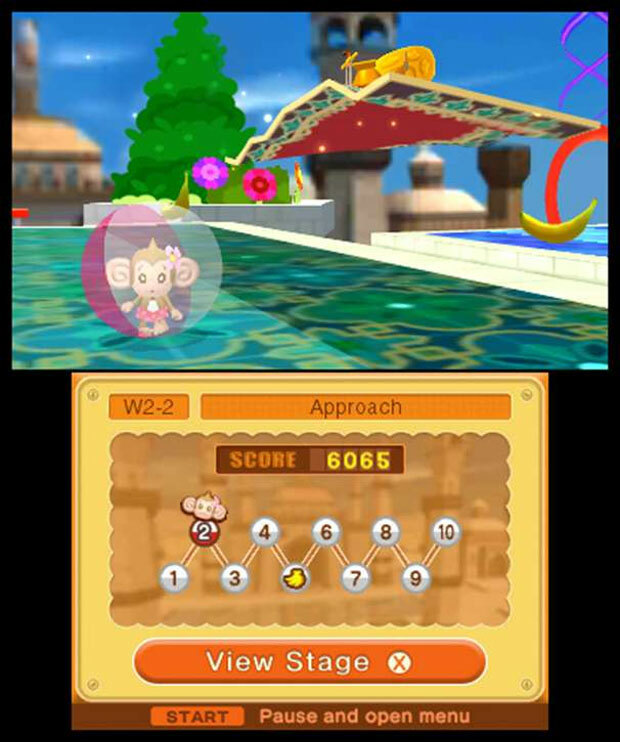 The primary gameplay mode is the puzzle mode where you need to carefully navigate your monkey ball through a rather treacherous obstacle course that contains all the classic levels from the original game, including a few extra bonus ones. You goal is to precariously balance your monkey ball as you collect bananas and make your way from point A to point B. As opposed to the original GameCube game, the control system of Super Monkey Ball 3D uses the innovative controls of the 3DS, more specifically the gyroscope technology that requires you to tilt your console to move your ball. Imagine putting a marble on a book that has a maze on it and you need to tilt the book to move the marble in that maze. This is how the gyroscope technology works. Even though this works like a treat, it can also be extremely frustrating at the same time. Generally it doesn't work too well with the 3D technology on this console because it causes havoc on your eyes. The workaround is either to turn off the 3D or to use the circle pad which is far more accurate than the gyroscope technology. Both work well but the circle pad is definitely the way to go. However as the levels progress, the difficulty of the maps that you play start to really challenge you. For example, there are lots of obstacles in the way that you need to avoid such as bumpers that knock you off the edge or areas that speed you up or slow you down. There are several elements to challenge the gamer and even though some levels can be excruciating, the addictive nature of the game always pushes you on to excel. 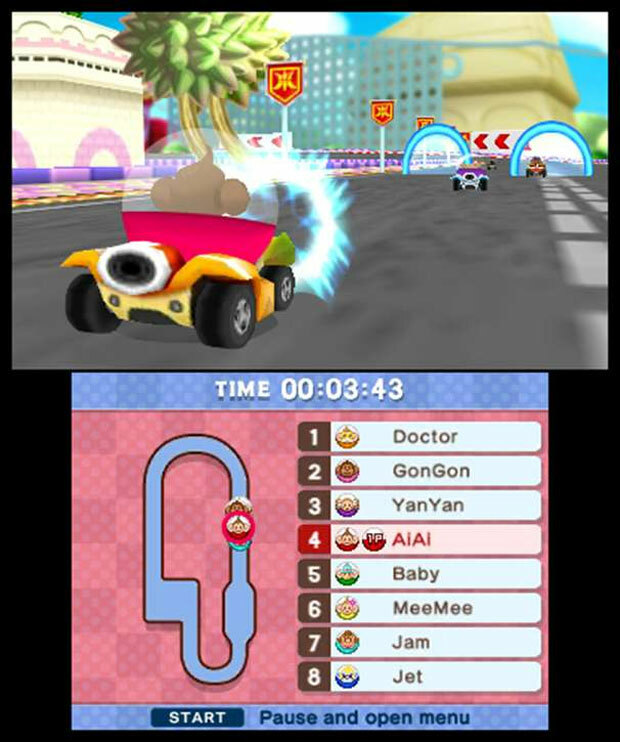 Apart from the main gameplay mode, Super Monkey Ball 3D offers two other games that include Monkey Race (ala Mario Kart) and Monkey Fight (ala Super Smash Bros.) Even though these two games pay homage to some other excellent Nintendo games, they are actually quite amusing to play on the 3DS. The better game of the two is Monkey Race that requires you to race around a track just like Mario Kart as you collect power-ups and attempt to knock your opponents off the track. The control system really works well with Monkey Race and features some great replay value here. The other game is Monkey Fight that requires you to smack the other monkeys around in order to collect their bananas which does become a little repetitive but hey, who doesn't enjoy smacking monkeys around to collect their golden treasures. The game even supports multiplayer via Wi-Fi for classic monkey fighting in Monkey Fight. Graphically, Super Monkey Ball 3D is a good looking game on the 3DS. The 3D graphics are amazing, especially on the main gameplay mode that really creates an amazing depth perception. The environments are quite colourful and feature this whacky Japanese style of cartoon to it and best of all AiAi and his friends all look great in the game. Add in a friendly and bopping soundtrack, over the top sound effects and this is Super Monkey Ball at its best. In the end, SEGA should be commended for releasing one of their best Super Monkey Ball games to date. Not only does it pay homage to the original GameCube game but it features updated graphics and gyroscope technology that takes the franchise into the 21st century. It's a shame that the 3D doesn't work too well with the gyroscope but if you use the circle pad, the 3D works like a charm. Add Mario Kart and Super Smash Bros... err Monkey Race and Monkey Fight and there's definitely plenty of things to do. Super Monkey Ball 3D may go back to basics but there's plenty of fun to be had for the next generation of gamers.